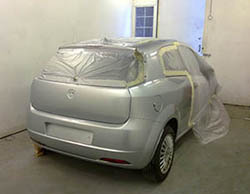 We offer full bodyshop facilities from a bumper scratch to a full repaint. All our facilities are in house with the latest technology as well as our fully mobile service. All our work is guaranteed, so if you live in Rochdale, Littleborough, Oldham, Newhey, Milnrow, Shaw, Bury, Bolton, Middleton, Whitefield, Prestwitch, Manchester and surrounding areas, come and pay us a visit. 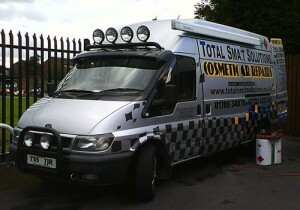 Also available is a 24 hour recovery service and as well as our full bodyshop facilities, we have also developed repairs around the S.M.A.R.T Techniques. Smart repairs are the perfect alternative to body shops repairs at a fraction of the cost. By repairing only the damaged area and not the full panel we can save you on average around 70% saving on body shop prices.Total smart solutions offer the ultimate mobile repair service, in and around the Greater Manchester area, which keeps the expense and inconvenience to an absolute minimum out of repairing your car. We understand the hassle involved in taking your car to a body shop for days/weeks on end, which is why we offer a fully mobile service for repairs meaning we come to you and not the other way round. All our technicians are fully trained to the highest standards and continue to offer a first class service as we strive to enjoy an excellent reputation for our quality workmanship. Using the very latest in environmentally friendly Water-Based Paint Technology and Top Quality materials, we can carry out paint repairs to a very high standard, at a very competitive price. Our sales team is dedicated to providing an accurate inspection of your vehicles whether it be one or one hundred Total Smart Solutions can cater for every eventuality and need. Please browse our testimonials for proof of our commitment to our customers. …to be reliable, trustworthy and competitive. To become a leading smart repair company in the local and surrounding areas, to be first choice for potential customers to contact us to arrange a comprehensive repair to their vehicle at their location at a time convenient to them. …and hopefully you will agree too. Please do not hesitate to contact us if you have any queries regarding any smart repair our dedicated team will be able to help you further. Had my bumper and alloy wheel repaired. They picked my car up in the morning and returned it after lunch. Very pleased with the work done.